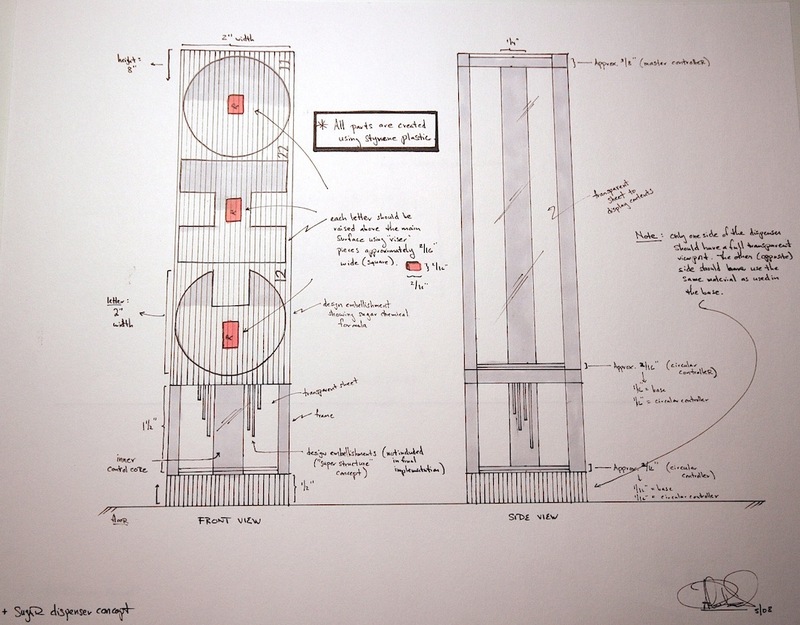 Several years ago, I designed a sugar dispenser for an industrial design class. I decided on this particular challenge after seeing just how quickly sugar poured out of a similar dispenser at a local restaurant. Through the design process, I discovered that it was my various interests that played a key role in the final product. Model Railroading: Once I had a general idea for what the dispenser would look like along with the relative dimensions, I created “sketch models” which are basically rough prototypes made from various materials. Thinking back to my model railroading days, I chose styrene plastic for later prototypes along with the final model. Styrene is typically used for the construction of miniature buildings used on a model railroad, and I decided that the material would work well for this project. Architecture (Core): I wanted the dispenser to be very modern looking and sleek; ultimately something much different from those you would normally see in a restaurant. I ultimately decided to model the dispenser similar in structure to a modern skyscraper, and I chose a variation of styrene to match the building’s fascade (narrow vertical lines without horizontal equivalents). Architecture (Supplemental): While I liked the skyscraper concept, I felt that another design element was needed. In one of my visits to the Los Angeles area I noticed a building that had a protruding metal “screen” with large-scale letters inset within (negative space). I decided that I would do the reverse and project letters outward (positive space). But what letters? Chemistry & Flight Training: Here I combined my original undergraduate goal (chemical engineering) with my flight training experience to come up with the “surface layer” that would rest on one of the dispenser “walls.” The chemical formula for sugar contains the elements Carbon, Hydrogen and Oxygen. Similarly, the airport code relative where I was living is CHO (Charlottesville-Albemarle). Clearly, the gods had spoken. The process of designing an object, vehicle, experience, etc. that has value in the real world takes not only solid design skills, it requires the ability to pull from multiple disciplines and incorporate those findings into something powerful. Until perhaps now, I have always believed that my desire for knowledge was simply leading me astray from a specialization of some sort. My experiences over the past several years have altered this belief; I now believe my innate curiosity enables versatility and a strong design sense, two things that I highly value. While I believe that specialization in a given field and/or domain is in my future (that was my original goal all along), I envision staying “plugged in” to just about everything and anything that interests me. It’s these interests that will continue to play a key role in my technical and creative development – the combination of which will continue to grow beyond what I’ve accomplished to date. Ever since I became interested in concept design in 2006, that interest continues to expand through the work of talented concept artists across the world. One artist and designer who I have learned from via Gnomon DVDs, and met briefly at the Art Center College of Design, is Scott Robertson. 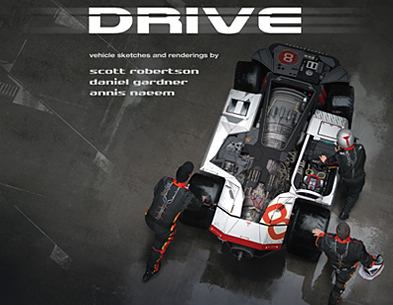 Late last year, Scott released a new book called “Drive” which includes a wealth of new and unique vehicle concept sketches and renderings. DRIVE features Scott Robertson’s very latest vehicle designs intended for the video game space communicated through skillfully drawn sketches and renderings. DRIVE builds upon the success of his prior two vehicle design brooks, Start Your Engines and Lift Off. Featuring four chapters, each representing a different aesthetic theme, Aerospace, Military, Pro Sports and Salvage, conceptual sports cars, big-rigs and off-road vehicle designs are beautifully represented through traditional and digital media sketches, and renderings. This is definitely one I will be adding to my concept art collection very soon.